Whether you are an individual or a company, you should approach online security in the same way that you would approach physical security for your home or business. Not only does it make you feel safer but it also protects people who visit your home, place of business, or website. It is important to understand the potential risks and then make sure you are fully protected against them. In the fast-paced world of technology, it is not always easy to stay abreast of the latest advancements. For this reason it is wise to partner with a reputable Internet security company. Here we have a very cool guide from Symantec, This guide will de-mystify the technology involved and give you the information you need to make the best decision when considering your online security options. For a glossary of terms, please see “Tech Talk Made Simple” at the end of this document. 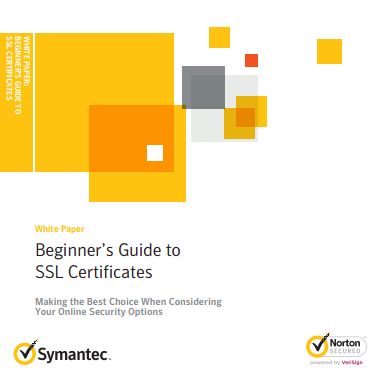 Download Whitepaper - "Beginner Guide to SSL Certificates"